The black Lens Cover for Canon 400mm f/2.8L IS Lens from LensCoat wraps the lens with a 100% closed-cell neoprene jacket, offering protection from bumps, jars and nicks. This cover allows you to blend in with your surroundings. It is useful for nature and outdoor photographers, as well as sports shooters and photojournalists. LensCoat Lens Covers also provide a thermal barrier, protecting your hands from cold lens surfaces in lower temperatures. It is easy to install and remove, leaving no residue on the lens. LensCoat Lens Covers are waterproof, providing protection to your lens in harsh conditions. This version is matte black to better blend in where desirable. Or, it can be used just for its protection value. 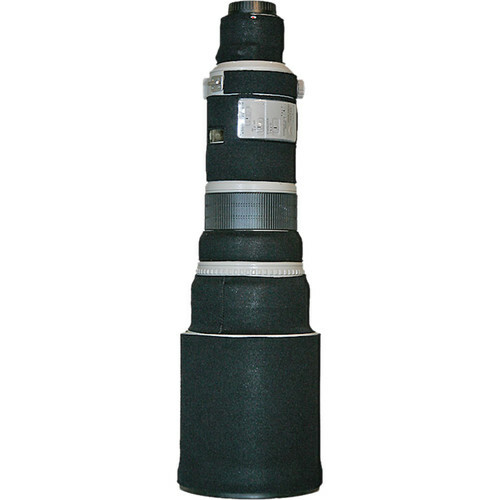 Box Dimensions (LxWxH) 10.0 x 9.0 x 1.0"
Lens Cover for Canon 400mm f/2.8L IS Lens (Black) is rated 4.3 out of 5 by 9. Rated 5 out of 5 by Anonymous from Great cover for protection I primarily bought this cover to protect my lens but would like to eventually get out and shoot some birds to utilize the camo cover. The camo print is perfect to tone down the Big White Beast in the wild and on the soccer field which is where I use it most. The cover goes on easy and stays put. All of the pieces are cut and sewn to fit perfectly. I also recommend getting the LensCoat end cap cover as it works quite well with the lens cover. I will probably be buying the LenCoat kit for both of my extenders also. Rated 4 out of 5 by peter from works well This neoprene cover is designed well and fits well on the lens. It kept my lens from getting to hot to the touch during a recent shoot. It also is nice for protecting the lens against dings and scratches. For me, it's nice not showing off the white lens for security and for blending in. Good investment. The only reason I didn't go five stars is the clean plastic cover makes it hard to change the switches. Rated 3 out of 5 by JayTPhotos from Does as advertised pretty straight forward. Install was easy and quick. Material quality is good and no issues so far. I do wish that the clear window to the controls were not there rather than having the clear plastic over them. Would make it easier to access the controls. Rated 4 out of 5 by birin from Protection and camouflage Protects the lens from scratches and provides camouflage for wildlife photo. Buttons and controls on the lens are covered by clear plastic, and a bit difficult to operate. Rated 4 out of 5 by bipock from Nice paint protection Good overall product. Price is too high in my opinion. Protects the paint and body from minor bumps and bruises. Not great for big drops or as a cushioning accessory. Rated 5 out of 5 by kgcphoto from Perfect fit Bought this to protect my precious 400mm f2.8 IS lens. The fit is great and it looks good too. I assume it covers this lens including the hood. Can it be used without the hood? Yes. They are separate items.